Killing the corner - dead? 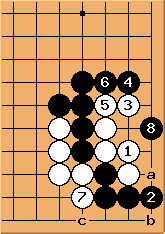 For the completion of this variation, see the section of 3-4 point high approach outside contact, tsukehiki hanging connection labeled Black Tenuki. 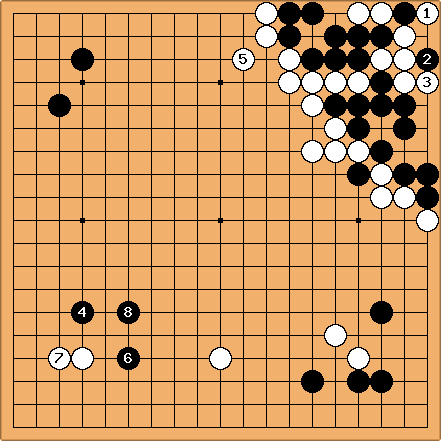 I've tried a lot of variations, the best result I got for white was a ko she takes first. Can someone show me a sequence how white can capture these three black stones unconditionally? Of course, I'm not sure, but this is what I see. If black cuts, I feel he is at an advantage, seeing all the thickness he's getting. 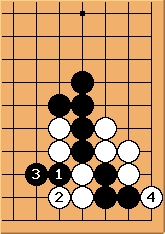 Bill: But doesn't Black do better by giving up only one stone in the corner? The exchange, - , looks good for White. Velobici: Strikes me that may be better for Black. makes straight shape. Straight shape is useful in fighting. seems to be a key point as well. 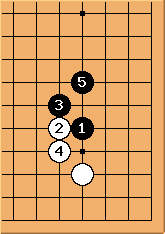 Now Black has four liberties to White's four liberties, but if White plays at a before b, it seems that she hastens her own death by taking an inside liberty first. When White saves a for the last move (the capturing move), she must play c before b, thereby effectively giving Black an additional liberty. 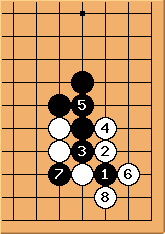 revo: I think that doesn't work for Black, cause White will play at . Black must play at a now, otherwise White would live unconditionally. And if Black plays a, he will be short of liberties. So Black can only play at the point of . He can build an eye then and will have enough liberties. 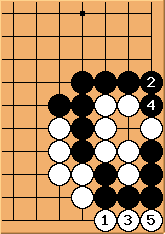 Thats why White can't block at the point to the left of and White will have to live by a. Then black can live too by extending left of . Dave: First of all how will B continue if is at 4 instead? 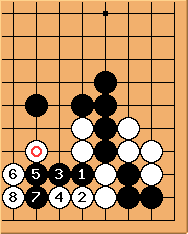 Black can never make eyes in the corner so if White pokes her head on the right side, the corner is dead. Dave: I believe that w5 here is the answer to the original question. Dave: Hmmm... I quess I was wrong. We are back to White taking a ko first. Dave: OK, simple is best? QWerner: Well, my solution looks simple, do I miss something? If Black playes elsewhere and white get 3, white will win. When black plays 3 white has to play 4 and black must block with 5. 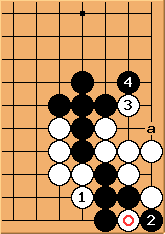 Black loss with all moves a - d.
Dave: I think there is no way for White to avoid ko after Black plays in at . I thought not playing the hane made a diffence, but I do not think that I was correct. This arrives at the same position by transposition. 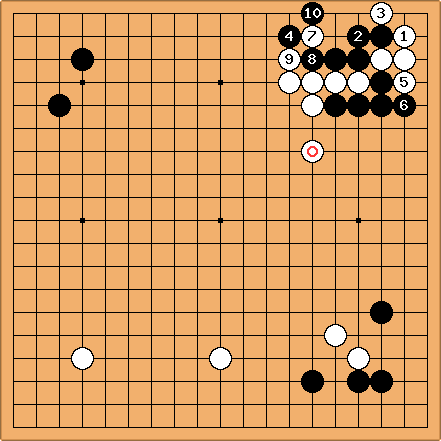 Black gets a ko. 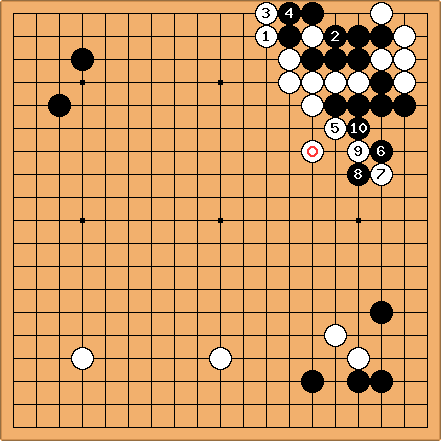 dnerra: The ko is extremely good for White. 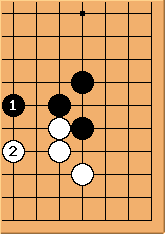 is a ko threat, so Black has to find the first non-local ko threat, AND black has to make an approach move at a, AND it is still a two-stage ko after that. Fair enough to consider this a win for White. 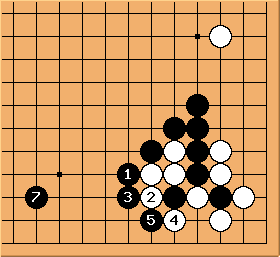 Dave: After reviewing the literature and professional practice, I think that we can conclude that the original statement in 38 Basic Joseki is incorrect. Black can not be killed outright. 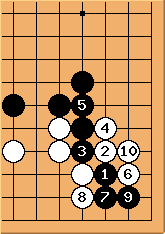 In Igo Daijiten it comments that the exchange of for allows White to kill a corner invasion outright. There is no analysis of the case where Black pulls out the invading stone when is not present. The marked stone is in the right position to protect the cut. 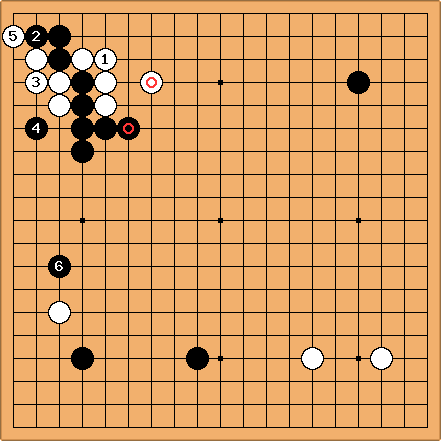 Here Kajiwara sacrifices the cutting stones by playing in order to ensure sente for the pincer at . 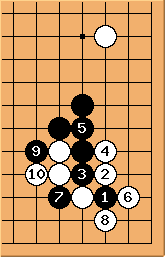 Notice that the two marked stones have been exchanged but the Black stone is differently placed than the Igo Daijiten case above, the White stone does not protect the cutting point if White descends with . 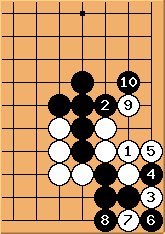 Now White proceeds to wall off the right side, getting payback for the marked stone played earlier. White builds the wall to the edge but turns back to rather than connecting . is an interesting play. 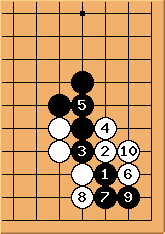 This makes the seki gote for White. 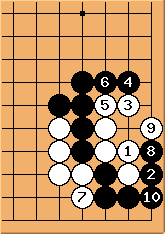 Note that if were a hane at 3, Black would have to connect to avoid a ko after , giving sente to White. 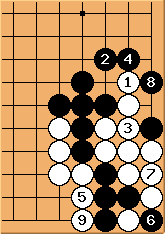 Now Black plays a ladder breaker at , forcing White to connect at . This gives Black the chance to play . 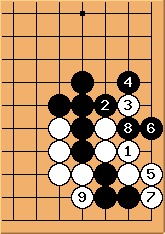 White's wall in the upper right is very impressive, however Black has meanwhile played multiple times on the bottom. The result was a win for Black. I think this game gives a good indication of the overall opportunity for the invader here. The invader need not die, but there is not a lot to gain.